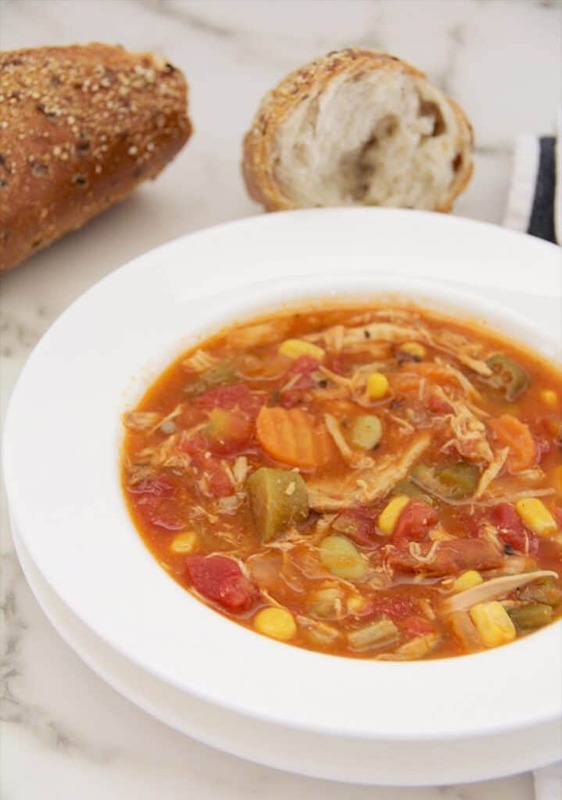 Chicken Vegetable Soup is filled with shredded chicken, butterbeans, corn, tomatoes, okra and onion—all frozen which means no chopping! Healthy, quick, and easy! This chicken vegetable soup is our new go-to for the winter. Well, in addition to Homemade Tomato Soup and White Chicken Chili. And easy Classic Chili. And my favorite Navy Bean and Ham Soup. Okay, we have a lot of go-to soups throughout the cold season! But back to this homemade chicken vegetable soup. I use frozen vegetables, with the exception of the onion, carrots, and canned tomatoes, so you really just dump everything into the pot and let it cook. Here’s a tutorial on How to Freeze Vegetables from Julie at The Little Kitchen. **Cook’s Tip: You could even make this in the slow-cooker! I wanted to come up with a hearty, homemade chicken vegetable soup recipe that is healthy and filling, so I included lots of vegetables. You can add vegetables in almost any combination—you could add potatoes or zucchini or leave out any of the ones I included if you don’t like those. This soup is so versatile! Butternut Squash Soup – with apples and caramelized onions! Cooked chicken – use a rotisserie for convenience! If cooking a whole chicken, place it in a large stock pot and add 2 carrots, 2 celery stalks and thyme, a little salt and pepper, and bring to a boil. Cook at a hard simmer for about an hour, until chicken is done and tender. Remove the chicken from the pot and discard the carrots, celery, and thyme stalks. **Cook’s Tip: If using already cooked chicken, then start with a large stock pot full of chicken stock. Add all of the vegetables to the pot along with salt and pepper. Stir to mix. **Cook’s Tip: Use pre-chopped onions and carrots to make this soup even more quick and easy! Add cooked chicken to the pot and bring stock to a boil, then turn down to a hard simmer. Simmer for about an hour, stirring frequently. **Cook’s Tip: Taste as you go, adding salt and pepper as needed. You may also want to add some dried herb seasonings. 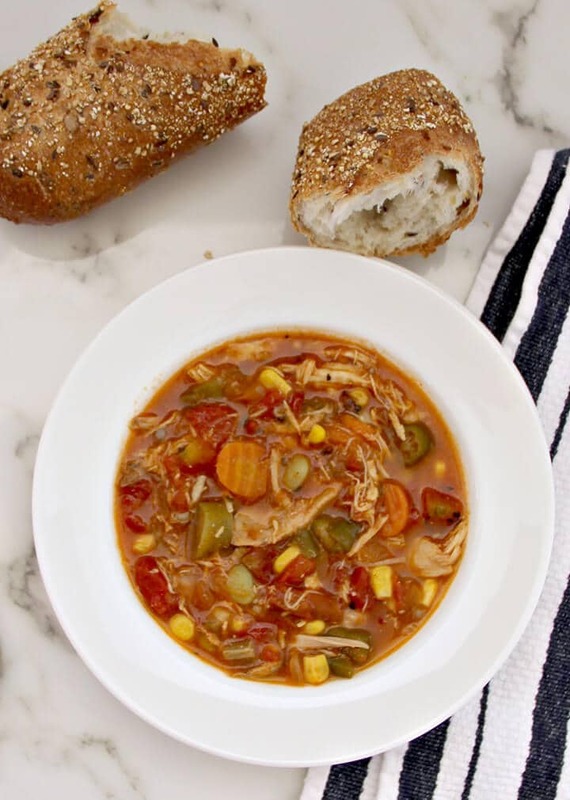 This homemade chicken vegetable soup is one of our favorite healthy recipes and I love that you can change it up so it doesn’t seem like the same soup every week. You could even make it with lean ground beef or ground chicken or turkey. Or no meat at all! Vegetarian vegetable soup! Just be sure you make some homemade cornbread to go with your soup. This soup is freezer friendly! Just let it cool then place in an airtight freezer container. I always keep some of these containers on hand since they’re cheap and perfect for freezing soups and other leftovers. This soup is a great make ahead meal too! Just prepare the chicken vegetable soup from start to finish and store in the refrigerator for a few days before you want to serve it. Chicken Vegetable Soup is great comfort food for grieving or sick friends. Package it in freezer-friendly containers, along with some crusty bread or cornbread. And don’t forget to include some homemade chocolate chip cookies! Chicken and Vegetable Soup is hearty, healthy and best of all easy to make with a mix of frozen and fresh vegetables. Place whole chicken in large stockpot and cover with water. Pour in chicken stock. Add 2 carrots, 2 celery stalks and thyme, a little salt and pepper, and bring to a boil. Cook at a hard simmer for about an hour, until chicken is done and tender. Remove chicken from pot and discard the carrots, celery, and thyme stalks. Note: if using ground meat or already cooked chicken then you can skip the step above and just start with a pot full of chicken stock. While chicken is cooling, add all of the vegetables to the pot along with salt and pepper. Shred chicken and add to the pot. Bring to a boil, then turn down to hard simmer for an hour, stirring frequently. Use a rotisserie chicken and pre-chopped onions and vegetables for convenience. The soup freezes well in airtight freezer-safe containers. This is a great make-ahead soup or comfort food to take to someone in need. Update Notes: This post was originally published January 6, 2016, and on January 16, 2019, was updated with one or more of the following: step-by-step photos, video, updated recipe, new tips. Can I use canned okra, corn and butterbeans instead of frozen ones? Curious. Thanks! This a great cold day recipe! Thanks much!